Description: Comfort and space, this is our largest Suite, perfect for a longer stay in Niagara-on-the-Lake. This Suite has a sitting area, larger flat screen cable TV and plenty of closet and dresser space for your personal belongings. Enjoy a glass of wine and watch the sun set on your private garden-view 2nd floor verandah. 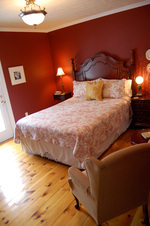 The Queenston Suite is decorated in rich red tones and furnished with local antiques. The 1925 Character has been kept with modern updates for your convenience. Our Suites are air conditioned and have wireless internet capability. Bathroom Description: 4 piece ensuite, tub/shower. Description: This Suite is loved for its coziness and warm golden tones. Our walnut antique armoire, two bright windows, gleaming pine floors will provide you with a tasteful comfortable visit. Our Suites are air conditioned and have a flat screen cable T.V. 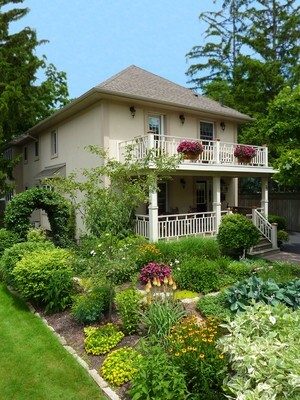 Description: The Chautauqua Suite embodies the casual feel of Niagara-on-the-Lake's cottage area. An antique brass bed, soft green tone textured walls, a high-top oak dresser and wide plank pine floors will make you want to return again and again. Our Suites are air conditioned and have a flat screen cable T.V.